The main object of the zenith carburetor is to supply the required quantity of fuel and air mixture of the correct strength as dedicated to the load condition of the engine. 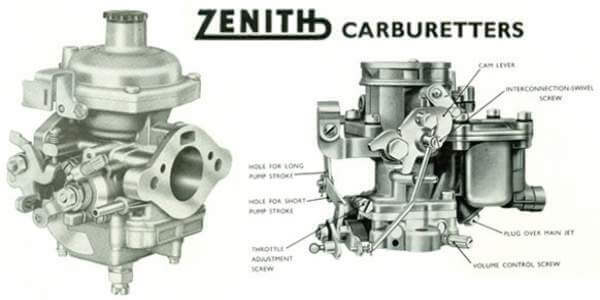 Zenith carburetor is also known as “British Carburetor” and used by various famous car manufacturers. The Zenith Carburetor Company Limited was a British engineering company making carburettors in Stanmore Middlesex founded in 1910. 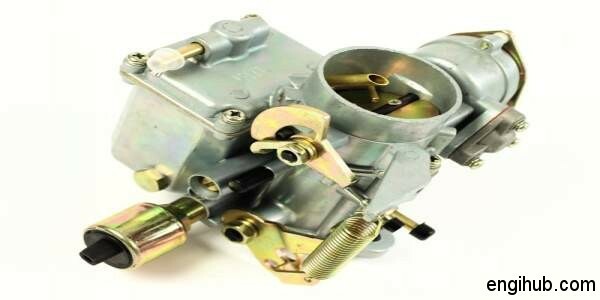 Zenith carburetor has also a number of designs available for different purposes. The other popular carburettors are AMAL Carburetor and Solex Carburetor. In this post, I will share detail information on zenith carburetor with you. Hope you like it. In this, float chamber is supplied with fuel from the fuel tank through a pipe. Whenever the float chamber falls short of fuel, the fuel from the fuel tank flows into the chamber at the fastest speed. The speed of fuel will match the requirement of an engine. Hence the float rises up, till it reaches a certain level. At this time, a needle valve moves down and rest against the seat. So, it resulting the stoppage of fuel supply from the fuel tank. The main jet is directly connected to the float chamber. While the auxiliary jet which is also called as compensating jet draws fuel from an auxiliary chamber (Reservoir). This auxiliary chamber is connected to the float chamber through an orifice. Both, main and auxiliary jet is opened up in the venturi. The air to the carburettor is supplied through the passage. The throttle valve is located at the end of the carburetor and connected to the engine suction pipe. The opening and the closing of the throttle valve controls the quantity of air-fuel mixture supplied to the engine suction manifold. An auxiliary nozzle from an auxiliary chamber (Reservoir) is located at one end of the by-pass. The other end of this nozzle opens up near the throttle valve. Because of lower velocity of air at the time of starting or slow speed of the engine, the suction produced at the venturi is quite insufficient to operate the main and the auxiliary jet in a nozzle. To improve the velocity of air, the throttle valve is closed to such an extent that there is only a small contracted passage is provided near the end of by-pass. By this, the velocity of air, passing through the region increases, producing the high suction. This operates the nozzle at the auxiliary chamber and the air-fuel mixture supplied through the holes. There is starting and slow running device is fitted in the reservoir (Auxiliary Chamber). To vary the supply of air to the nozzle, the set screw given is slackened and the whole assembly is taken out. By the suitable number of rotation of screw joint, the position of an auxiliary nozzle is set. The whole device is then again fitted to the carburettor and tightened the screw. At this condition, the throttle valve is opened about 66% and as the air entering through the passage. It passes through the venturi, its velocity increases due to smaller area consequently its pressure drops. Hence resulting in the suction effect. The fuel is sprayed in the venturi by a main and auxiliary nozzle. As the speed of the engine increases, thereby producing the greater suction. Due to this, greater fuel being supplied by the main nozzle. Since the compensating jet (Auxiliary Jet) draws fuel from a reservoir (Auxiliary Chamber), which is subjected to atmospheric pressure, through the air, the quantity of fuel supplied by it to the venturi does not change to an appreciable extent. This has the effect of supplying a weaker solution than if only one jet were a provider in which case, the air-fuel mixture supplied at high speed will be richer than desired. Thus the compensating jet enables the air-fuel mixture of the desired strength to be supplied. In fact, with the correctly proportioned design of various parts of this carburettor, the fuel supplied by the main and compensating nozzle can be made to bear almost a constant ratio to the air supplied.